These plants produce fruits from ½" to 2". These little fruits can be red, black, orange, pink, purple, green, yellow, ivory, white or bicolor and in varying shapes: round, pear, grape, heart, ping pong, pea-sized and plum-shaped. Amy's Sugar Gem ($6.25) (Ch) 65 days. This huge, sprawling plant produces heavy clusters of golf ball sized, incredibly delicious, deep red ambrosial fruit with tiny golden jewel-like sparkles within the red skin. Very sweet! It was one of my absolute favorite tomatoes at TomatoFest in September--just knocked me out. Candy-on-the-vine, not to be missed. Developed by Jeff McCormack, it is a cross of Red Cherry and Tappy's Finest. Named for Amy Boor Hereford whose Grandma Tappy introduced Jeff to heirloom tomatoes more than 20 years ago. Black Cherry ($6.25) F/C (Ch) (VE) 65 days. Blondkopfchen will be available beginning April 10th. Blondkopfchen ( Blond-copf-shen) ($6.25) 75 days. 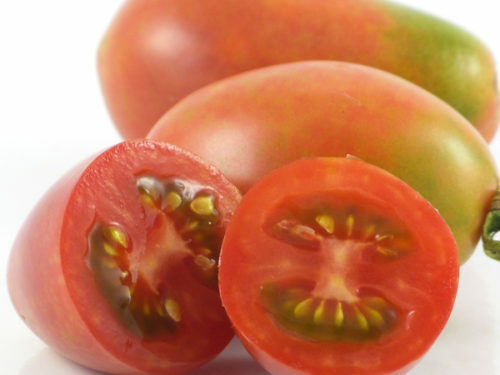 One of the finest tasting cherry tomato in existence, the name of this marvelous German heirloom cutie means Little Blond Head or Little Blond Girl. The big leafy plant produces thousands of ½" grape-size sparkling yellow-gold cherry tomatoes in phenomenal clusters of 30 fruits per bunch! Delightfully sweet with a citrusy finish, this is the one to try with children who don't think they like tomatoes. As Gary Ibsen of Tomatofest.com says, " Just put one in your mouth and try to keep from smiling!" No cracking, with great disease resistance, this little sweetie grows anywhere and produces right up until frost. Challenging to pronounce, really easy to eat. Butterfly Cherry ($6.50) 75 days. This plump multi-color bullet-shaped cherry is pink with pretty green shoulders and a rich full bodied flavor. Smooth flesh and high production. Sweet, but not sugary, with just enough background tang to give it old fashioned tomato goodness. High production, really easy to grow and beautifully yummy! A real treat for your tomato loving family and friends. Foxy Lady ($6.25) (E) (HG) (70 to 75 days). This rapturous little cousin of Purple Haze is one of the newest additions to our heirloom cherry selection. The flavor, is energizing, elaborate and dazzling with a sweet, seductive background and earthy nuance with lingering flavors. A tiny touch of tang balances its big full-bodied sweetness. I am madly in love with this tomato. Early ripening and growing in huge abundance on big plants in clusters of 5 to 7 fruits, Foxy Lady ripens in only 70-72 days from plant out and has some of the biggest potato type leaves I’ve ever seen. Hartman's Yellow Gooseberry ($6.25) 75 days. This very old variety from the 1830's is a brilliant 1" to 1½" yellow cherry tomato with big sweet flavors that explode in your mouth with an elegant irresistible pop! Just try to get more than a handful into the house after picking them vine-ripened and warmed from the summer sun. A rare treat. Huge harvests. Incredibly prolific. One of the the best tasting yellow cherries and you will have enough to give them away by the basketful. Originally from John Hartman of J.M. Hartman & Daughters seed company in Indianapolis. To quote William Woys Weaver: "The vines are long, rambling to 8 or 10 feet, and thus require staking. 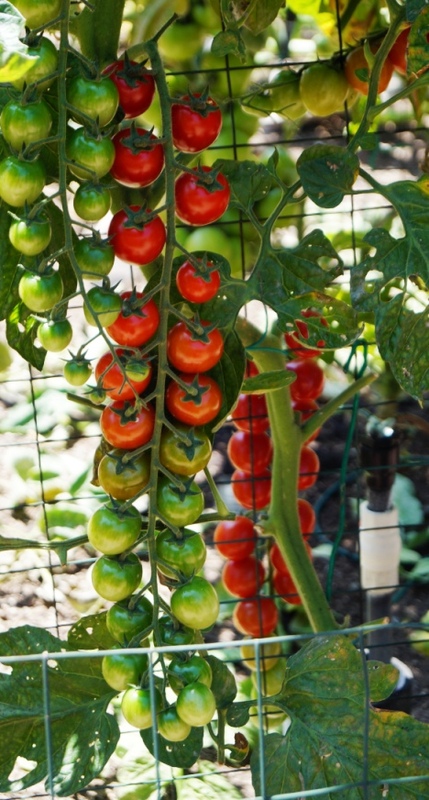 The fruit hangs in clusters of 6 to 8, and individual tomatoes are larger than a true gooseberry, and well flavored. The fruit color is lemon yellow. This variety is one of the first to come to fruit, and it remains productive until frost. The plants are somewhat frost tolerant at 28° to 32° F."
Hawaiian Currant ($6.25) (Ch) 80 days. It grows in abundant grape-like clusters, each cluster holding onto its little red pea-sized fruits, until all are perfectly ripe. Be sure to snip off the entire ripened cluster as you would with a cluster of grapes on the vine, rather than trying to get these teeny little guys off one at a time. The flavor of Hawaiian Currant is unbelievably deep, rich, sweet, and lingering on the palette, a tiny terrific dream of a tomato. Photo Courtesy of Bunny Hop Seeds, thanks Ellie! These gorgeous 1½" perfectly round cherry tomatoes are deep pink and with sunshine yellow streaking -- perfect for fresh tomato salads! Sweet flavor and distinctive looks make them a great choice for home gardeners and for market growers to use in colorful pints of mixed cherry tomatoes. Crack-resistant fruit develops on strong plants. Add this to your Bumble Bee collection along with Purple Bumble Bee and Sunrise Bumble Bee! The Triad of Bumble Bee-ness! A dwarf plant with cherry tomatoes! Many of you asked me for it; you're wish is my command! One of the first of the dwarf varieties to produce cherry tomatoes. 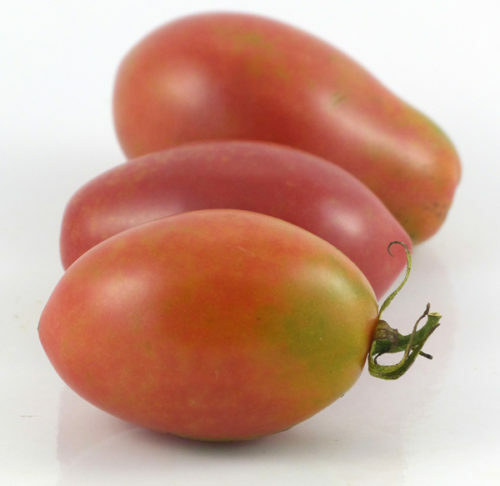 Sweet and perfect, Pink Opal grows scads of delicious cherry tomatoes on a dwarf 3 ft. plant. It may occasionally select back to other fruit colors from it parent lines. All are yummy! Delicious and very productive, this little guy deserves a place in your tomato garden. Purple Bumblebee ($6.50) 65 days. Look at these dark, dusky beauties! 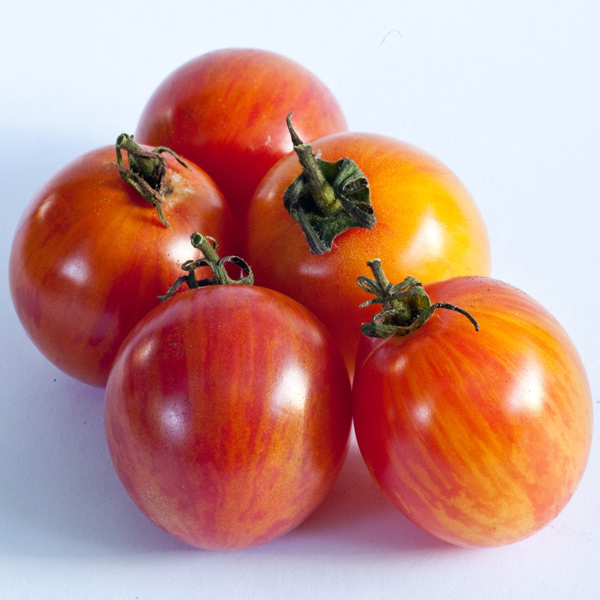 Purple Bumble Bee is a new delightful 1" cherry tomato with all the deeply complex smoky flavors of the black tomatoes. With dramatic grey-green stripes and stunning purple flesh inside, this little treasure will be a favorite treat in your garden. Crack resistant, disease resistant and a high producer all season long! You will have basketsful to share. Bred by Fred Hempel of Baia Nicchia Farm in Sunol, CA. Way to go, Fred! Yes, I know.... but it is real. I've gotten dozens of calls and emails recently from gardeners searching for Rapunzel plants. So here it is! This new, awesome hybrid produces tremendously long clusters of bright red, one inch, sweet juicy tomatoes all season long. The fruits themselves have a sweet rich flavor and the ridiculously dazzling trusses will have you doing a double-take. Some of the 'strands' hold more than 40 tomatoes. Pretty cool. Great for containers! This plant makes a delightful gift for gardeners of all ages -- especially kids and grandmas-- and grows easily in all climates and is disease resistant, too. The photo on the right is a Rapunzel plant grown by our customer Jeff Hartang. Yay Jeff! Sun Gold ($6.95) (EE) (H) 55 days. This is the one of the best cherry tomatoes I've ever tasted and ready to pick in only 55-60 days. It has the big, rich flavor of a full-size tomato, in a beautiful little deep-golden fruit growing in bountiful clusters on a huge plant. Sweet, rich, so beautiful...just left of center in top photo. Most of them won't make it into your house from the garden. If you send someone to pick them for you, keep your binoculars trained upon the picker. What can I say? I've never seen anything prettier in the cherry tomato world. Huge harvests, too. This a very special cherry tomato, an astounding artisan variety. Please put this plant into your garden -- but remember -- it will make you way too popular. Sunrise Bumblebee is plump and bountiful, crammed full of old- time sweet, juicy, pop-in-your-mouth tomato flavors and just as cute as it can be. This is the tomato you would steal from your neighbors in the middle of the night. But don't; grow your own. Sweet Leilani ($6.50) 65 days. This luscious little sweetie is a cousin of Purple Haze, yet this one grows tomatoes that are twice the size. Not a small cherry, reaches about 1½". A very heavy producer with clusters of 6 to 10 tomatoes. It surprised me in my garden as a cross of Foxy Lady and I'm not sure what! Maybe Amy's Sugar Gem? Showing up in shades of deep mahogany, purple and brick red, Sweet Leilani lives up to its name. Sweet! Growing to 2" on a hearty plant, it produces loads of yummy tomatoes with that tropical, smoky sweet flavor we love in the purple and black varieties. I am happy to name it for my granddaughter Leilani who is smart, funny, beautiful and a sassy little thing. These perfectly charming deep-red strawberry or heart shaped fruits average 1" x 1" with very sweet flavors, very tender flesh and more juice than most cherry tomatoes. The flavor is divine and the appearance is stunning. 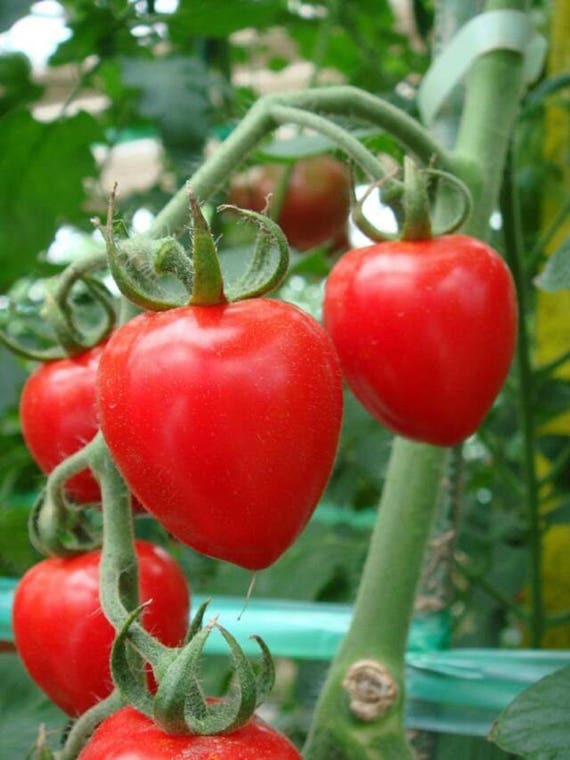 Ripening in only 50 to 60 days, Tomatoberry is an outstanding addition to your garden. A heavy producer, hearty vines, a real show-stopper with the flavor to match! This deep purple cherry tomato grows in great abundance on a small dwarf plant. If you have a limited garden space and crave a really sweet, rich flavored cherry tomato, this is the one for you! High production of 1 to 2 ounce cherry tomatoes will keep your tomato tastebuds really happy all season long -- and you'll have enough to share with loved ones. This tomato was selected out and named by Susan Oliverson of the Dwarf Tomato Project. A wonderful little tomato! 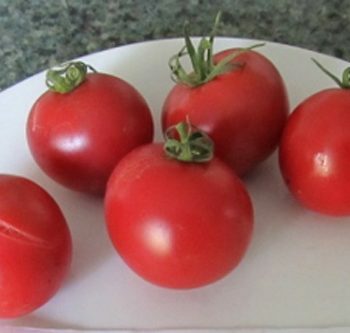 Similar in appearance to Yellow Pear but with a deep, rich, very sweet flavor and excellent texture, Yellow Submarine is replacing Yellow Pear for many gardeners who long for this beguiling shape and color but with big, scrumptious old-time tomatoey taste. Now the cutest little tomato also has great big flavor! A Laurel's exclusive. Shown growing in a 25 gallon Tan SmartPot in our garden. Photo by Adrienne Park-Tucker.